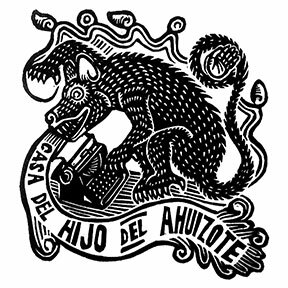 Linocut logo I designed for Casa del Hijo de el Ahuizote in Mexico City. El Hijo de el Ahuizote was a newspaper that was published in 1902 by Juan Sarabia and Ricardo Flores Magón in Mexico City. They where committed liberals who denounced the tyrannical government of Porfirio Díaz who had been in power since 1876. In 1903, the Flores-Magón brothers were forced into exile by the Díaz regime to the U.S. where they continued to publish their work and smuggle it into Mexico. Flash forward to 2014, one-hundred and eleven years later, Diego Flores Magon, great grandson of Enrique Flores Magon, has managed to recover the building from which they were exiled that once housed the presses that published the incendiary newspaper, and turn it into a museum. The museum doesn’t have an old iron jobber press and type cabinets as it once did but it does count with a newly acquired Risograph printing machine. Seeing the political climate that Mexico finds itself in, it’s difficult not to see how the times do not lend itself to action. For many years now Mexico has turned into a devil’s playground. Plagued by rampant violence and a corrupt government with close ties to drug cartels, citizens have finally had enough. When 43 students from Ayotzinapa in Guerrero state “disappeared”, people mobilized and staged strikes, protests, performances, and marches throughout Mexico. The world has joined in global actions of solidarity with Mexico. In an impromptu action, artists and poets from different cities in the U.S. came together to send a message of solidarity by sharing their work, which was printed at La Casa del Hijo de el Ahuizote and distributed freely during the December 1st and 6th marches. Here is a link where you can view the results of the collaboration. If you would like to show your solidarity with La Casa and our project, please share photos and posts using #MexicoNoEstaSolo.